The miniature of Saint Catherine of Alexandria tended by angels opens the suffrage to the saint in this luxuriously illuminated book of hours. According to the legends describing her life, Emperor Maxentius had Catherine beaten and then imprisoned without food or water for twelve days because of her refusal to worship pagan idols. During this ordeal, angels comforted and fed her. The crowned woman who enters Catherine's chamber on the left is Maxentius' wife, who, upon seeing the ministering angels, converts to Christianity. 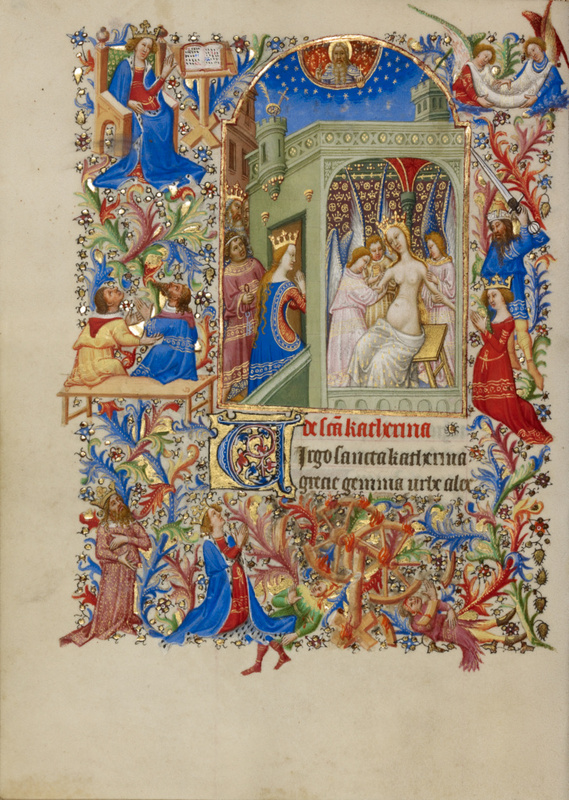 In both composition and style, this miniature is related to one in the Belles Heures of the Duke of Berry, illuminated by the celebrated Limbourg brothers. Key episodes of Catherine's life are shown within the border's colorful foliage.